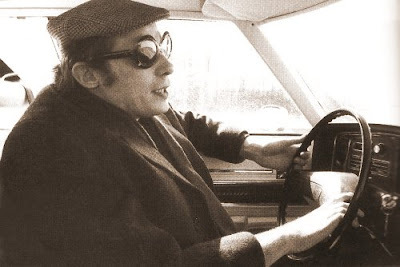 "I suppose it can be said that I'm an absent-minded driver," Glenn Gould [seen above] once said. "It's true that I've driven through a number of red lights on occasion, but on the other hand, I've stopped at a lot of green ones but never gotten credit for it". Having recently bought the Arabian Passion on your "recommendation", I now find myself awaiting delivery of Glenn Gould's Byrd, Gibbons and Sweelinck disc, having followed an Overgrown Path last night. What other Gould recordings do you think I should not be living without? I currently only have the Bach recordings? Glenn Gould's 'contrapuntal radio' documentaries made for CBC are really a special case, and I will return to them in another post. But it is worth pointing out that the CBC Records CD release Glenn Gould the Radio Artist includes his Stokowski and Casals documentaries as well as the Solitude Trilogy. Worth buying just for the tantalising snatches of Casals oratorio El Pessebre, a work that is inexplicably absent from the CD catalogue. The CBC set does not include Gould's profile of the pop singer Petula Clark, but I am trying to rectify that and am making tentative enquiries about a legal webcast of that legendary programme. But back to Glenn Gould the pianist (contrapuntal blogging?) and a CD that drives through a number of musicological red lights, but which I certainly could not live without. Gould once described piano transcriptions of orchestral works as typically being 'glorious mud', something he tried to rectify with his own transcriptions of Wagner. 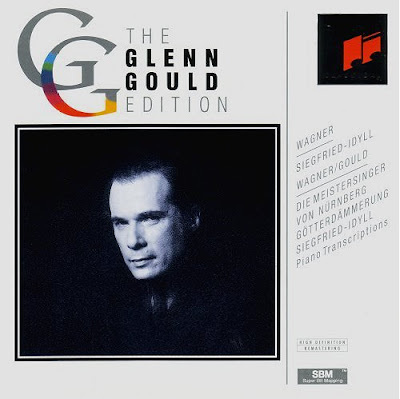 In 1973 Gould recorded his piano versions of the Mastersingers Prelude, Dawn and Siegfried's Rhine Journey and the Siegfried Idyll. Instead of 'glorious mud' there are crystal clear textures which underline the contrapuntal elements in Wagner's scores, in fact the transcriptions almost sound as though they were created for the harpsichord. The piano arrangement of the Siegfried Idyll is beguilingly beautiful, but Gould had not finished with that particular work and we will return to it below. One of many red lights Gould drove through in his piano transcriptions was the taboo on multi-tracking in classical recordings, and for the Mastersingers Prelude he overdubbed a second piano in the last section to allow the different orchestral voices to sound through. Probably the most inept, amateurish, wrong-headed rendition of a major classic ever put to vinyl. Each to their own: personally I find Gould's orchestral Siegfried Idyll idiosyncratic but deeply moving. There have also been wrong-headed attempts to brand it as some kind of artistic last will and testament because Gould died just weeks after the sessions. All of which is nonsense as he died suddenly from a blood clot on the brain of which he had no advance knowledge. His speeds may be agonisingly slow, but there should be room in any CD collection for more than one view of the Siegfried Idyll. Sony's CD release gives you two Idyll's for the price of one, and that price is currently the ridiculously low $3.99 for the complete album as a download from amazon.com. And of course there should be room in any CD collection for more than one Goldberg Variations. I have been enjoying the Byrd/Gibbons disc for many years. I should be more popular among Gould's discs. The Glenn Gould Reader is fun. Hell yes his driving was bad! He failed to notice me LEGALLY crossing the intersection and almost mowed me down. He was completely unaware! From that point on, whenever I crossed that street (the one in which the underground garage to his apartment building exited onto), I more than double-checked what was approaching!